A boom, two wireless mics, and a recorder. That seems very straightforward and certainly covers the bulk of interviews and ENG type jobs. Mixers who primarily work in reality or narrative work will have a much more complex basic kit due to the requirements for those jobs. But what actually goes into making this stuff work? Basic Maxx bag with room to grow. Maxx bag, gutted after micing the Tasmanian Devil. Why Have A Base Kit? Well if you rent a camera, it stands to reason you need lenses, media, and a tripod or something to at least set it down. If you rent lights, a lot of camera people and gaffers will have a basic interview kit or something similar because a single light doesn’t really give you many options, but three lights lets you illuminate your subject’s face and give a little back lights so they pop out of the background. In the same sense, a basic audio kit provides me the tools to accomplish most jobs and for anything more complex, it creates a platform that I can quickly build from. You can’t just have a recorder and get great results, or have a microphone with nothing to plug it into. The basics for recording sound are covered and any extras like IFB headsets or extra wireless mics can be easily added in. So what is involved in creating a package that is just a boom, two wireless mics, and a recorder? I bring my condenser microphone collection onto every job, including my trusty Sanken CS3e shotgun mic and Schoeps CMC6 MK4 cardioid so I can choose the best mic for the room and the setup. This also includes an internally cabled boom pole and XLR cables. I also need support gear like the shockmounts, and wind protection. A boom is typically a condenser mic and is analogous to camera lenses. There may be one or two that I go to for most situations, but generally there isn’t one mic that is good for 100 percent of all situations. FUN NOMENCLATURE – A “Shotgun Microphone” is the colloquial term for a condenser microphone with an extremely directional pickup pattern, meaning it’ll pick up whatever you point it at while cutting out a lot of extraneous noise. I suspect the name comes from the characteristic elongated shape of these mics. I’ve heard European crews call them canon mics. 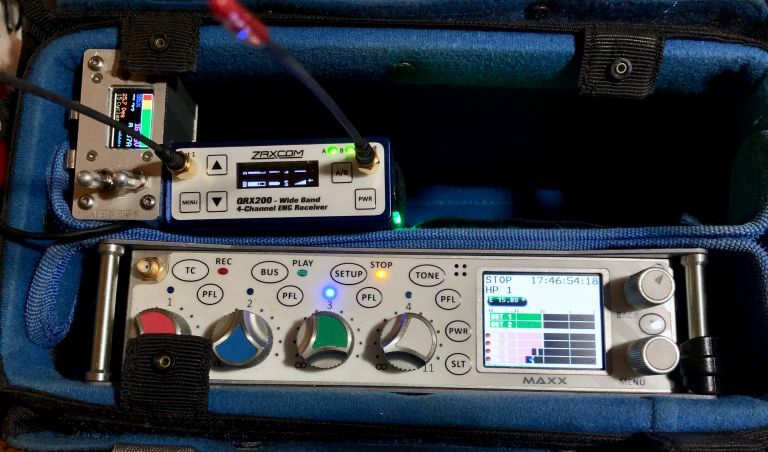 I use both Zaxcom and Lectrosonics Systems in my kit, and these are not cheap systems. 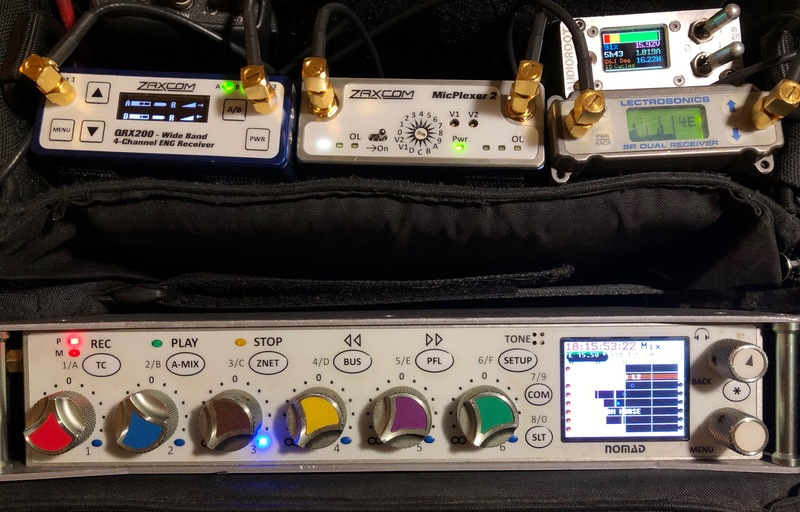 Two wireless require two body pack transmitters and a receiver, and the pair of wireless lavaliere mics can push the cost of this system to about $6,000. I also have a lot of different clips, several rolls of tape including hypoallergenic medical tape, double sided, and moleskin. FUN SHORTHAND – Sometimes people just say, “Lavs,” even though lavalieres refer to a small body mic. We understand you also mean the transmitter and receiver for that to be practical. Depending on the job, I will use either my Zaxcom Nomad or my Zaxcom Maxx (no relation). 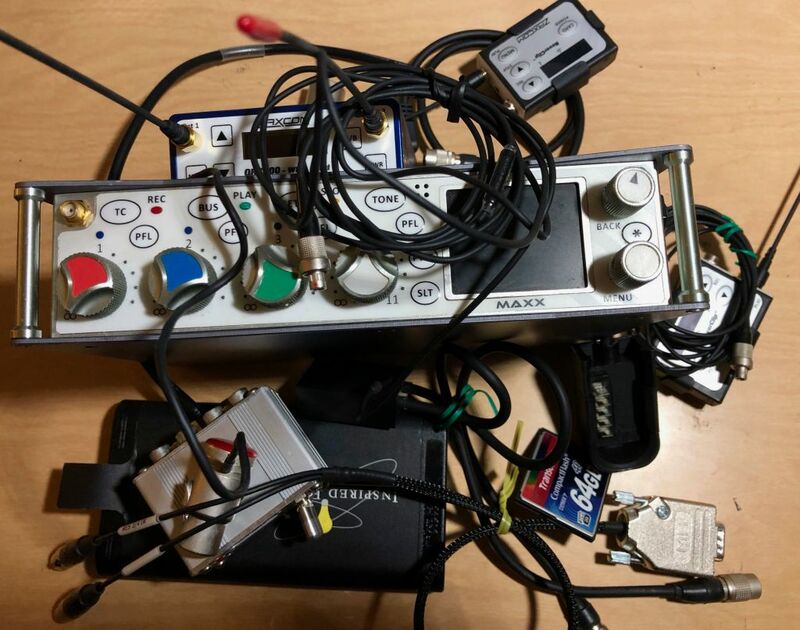 Of course I need to connect everything together, so there are at least two cables for the wireless system, at least one for the boom, a bag for everything, and some way to transport everything to and from set, usually a Pelican or Orca case and my car. What else is missing? Oh yeah, power. I need a system with batteries to run the whole show, and AAs won’t cut it when I want to run a recorder and wireless receivers all day. Headphones too. Those are sort of important if I want to hear what I’m recording. My more typical Nomad bag build designed to handle anything. So What Is Actually In A Basic Kit? One 32 BG or greater CF Card for the Maxx. All told, a boom, two wireless mics, and a recorder, well those four items are actually forty-three items needed to make it all work, and I’m not counting my car and comfortable shoes in this list! But if I assume every single job starts with that as it’s basic need, then it becomes a very simple matter of adding one or two items to this platform when the job requires a little bit more since all the basic support needs are automatically taken care of.